The Twixt Active Seating Chair from Safco Products is intended to subtly encourage the user to actively engage their core muscles in movement through the course of the day. The Twixt is supported by a sturdy cast aluminum base equipped with a flexible ring that can compress as users lean away from the vertical, permitting the seat to tilt in any direction the user chooses. The large 15.5" diameter seat is well padded, with waterfall edges to reduce the potential of encountering pressure points from the seat edge. Users can also freely pivot a full 360° which makes it possible to turn away from a desk or workstation without the need of moving the seat. Seat height adjustment is accomplished with a gas spring cylinder, activated by a convenient release ring just below the Twixt seat. The gas spring also acts as a shock absorber to eliminate any jolts as one sits down. There are two height ranges available — the Desk-Height version which adjusts from 17" - 22" for shorter users or situations where lower seating is more suitable, and the Extended-Height model which adjusts from 22" to 31.75", making this model better suited for taller persons or for use at height adjustable sit-stand desks. The Twixt is available with either Mesh Fabric or Vinyl upholstery. 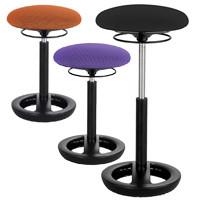 Reduces Weight Load on Legs and Feet - Because of its more "stool or chair-like" design users tend to use the Twixt Chair at a lower height than other seats which are more better suited to the leaning posture, such as the Pivot or Mobis Seats. The result is that a higher percentage of weight is transferred to the Twixt. With the Twixt bearing the primary weight load the pressure on the joints of the lower limbs is greatly reduced. This translates into reduced risk of damage to the knee and hip joints (which can occur when these joints remain under continuous strain from standing on hard surfaces). "Active Working" Dynamic - The base of the Twixt features a flexible ring intended to permit a user to shift their weight to move the seat. The ring does compress somewhat under pressure and provides a degree of "rocking" albeit with a reasonably high degree of resistance. Users looking for "free movement" should consider other options such as the Pivot or Mobis seats. which offer a much greater degree of freedom in achieving this movement. 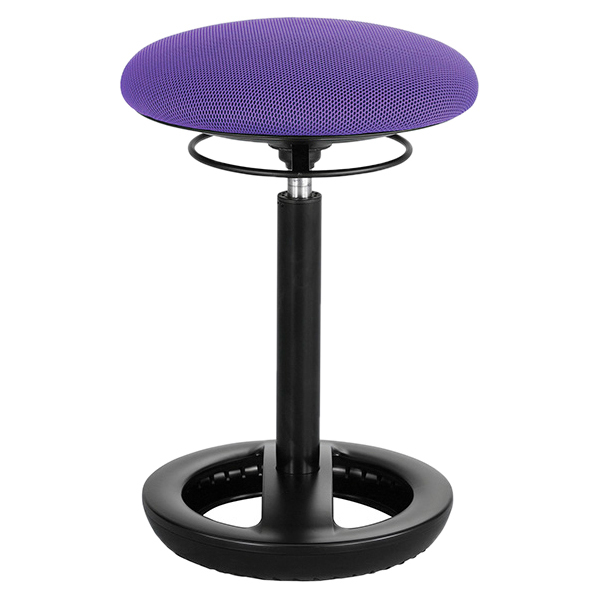 The ability to move or rock the Twixt can encourage users to actively move their body throughout the day. This movement can benefit the entire body as it will exercise core muscles in addition to the muscles of the legs. Flexing of the muscles of the legs is difficult when in a traditional standing position and can lead to swelling of the lower legs (edema) as blood and fluid collects in them. Relaxed activation of those muscles is encouraged by the Twixt Chair as the muscles are employed to shift or rock the seat throughout the day. As well, because the Twixt carries the primary weight load these muscles are not held in constant tension but can be easily flexed, even when not rocking the Twixt. Although minimal, this minor flexing aids in moving fluids back into the circulatory system. Helps Achieve Correct Spine Posture - When used as a "leaning" seat, the Twixt Active Seating Chair aids users in achieving a forward tilt on the pelvis which naturally encourages the "S-curve" necessary for proper spinal alignment (see image in gallery). This positions the head over the spine, ensuring that the back can provide the necessary support without fatigue. This also encourages a noticeably more upright stance, with a reduction of the forward bend of the neck. By combining the Twixt with a correctly positioned monitor the head can be properly supported over the spine. Not only is this a relaxed position, it is also healthier and places less strain on the muscles of the neck and upper back. Promotes Health of Spinal Discs - The "Active Working" referred to earlier also has a positive impact on the spine. The continuous movement creates a "pumping" action within the spinal discs. This action aids in drawing nutrients into the discs and expelling waste, resulting in healthier discs. Improves Internal Organ Activity - When used as an elevated stool or leaning seat the Twixt Active Seating Chair can open up the "torso to thigh" angle which reduces pressure on the internal organs. This means easier and deeper breathing as the lungs are no longer compressed and the diaphragm is not restricted. In addition, this stance and the resulting increase in movement also encourage a more active digestive tract and improves overall circulation. Increases Mental Alertness - The Twixt offers the potential for mentally stimulating movement in both sitting and leaning postures. As well, using the Twixt for leaning creates an upright posture, deeper breathing, improved circulation, and increased ability to move, all of which increase overall cardiovascular activity that can lead to improved mental alertness. Can Reduce Risk of Lower Back Pain - For many people, standing in a static position for extended periods with the feet flat (such as at a standing desk), can lead to lower back pain. The muscles of the lower back are able to relax when the Twixt is used to carry the weight, while still permitting the user to maintain an upright posture. This is best achieved when using the the Twixt as an elevated stool or "leaning" seat. Expands Comfort Zone - The 360° pivot rotation and potential tilting range of the Twixt, combined with the upright stance, offers users a greatly extended reach which cannot be achieved with fixed leaning seats. This expands their comfort zone, providing access to a larger area of the worksurface while at the same time reducing the risk of overextension. Decreases Neck Rotation - Rather than relying on neck rotation to view to the sides, Twixt users can rotate their entire torso since the seat freely rotates with body movement. 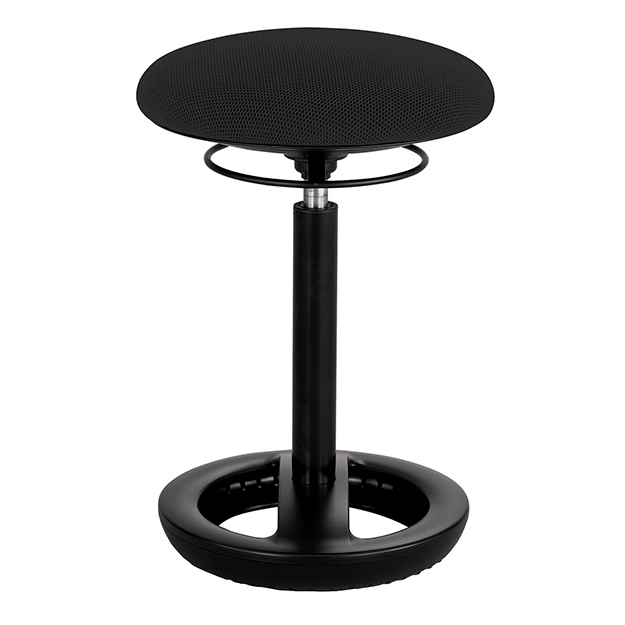 Active Seating Base: The base of the Twixt has a flexible ring which permits users to shift their weight to tilt the Twixt. The ring compresses to a degree under the pressure, permitting the seat to lean in the direction of the compression. By shifting their weight in different directions users are able to generate a degree of rocking motion. The flexible ring is somewhat resistive to the compression and does require a degree of conscious effort to accomplish the movement. Adjusts to Fit the User: The Twixt comes in two heights. 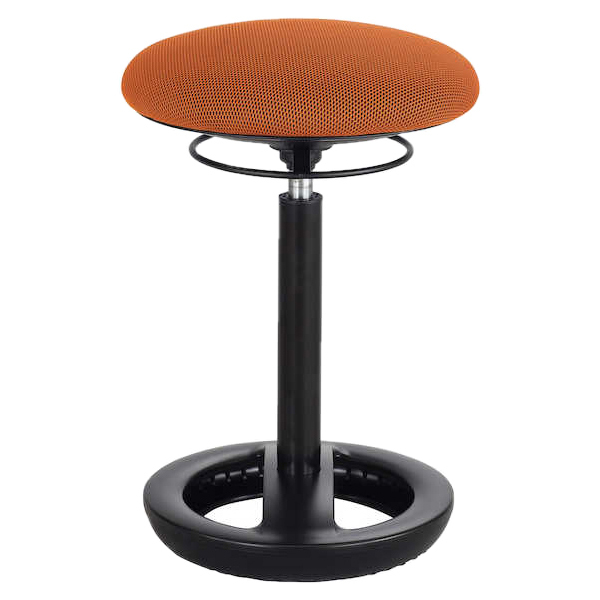 The standard height model provides seating heights from 17" - 22", and is best suited for use where the intent is to use it more as a chair than a "leaning seat". The very shortest of users might be also be able to employ this for leaning purposes. 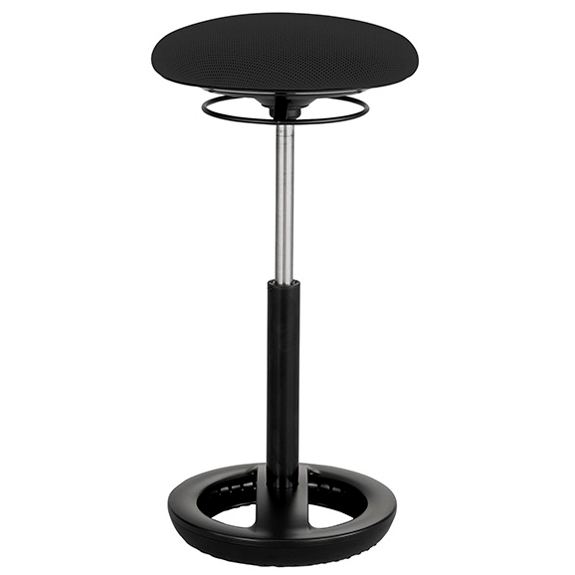 The Extended Height model adjusts from 22" to 31.75" which makes it much better suited to use as an elevated stool or possibly a "leaning" posture. Comfortable: The round convex seat on the Twixt Active Seating chair features a waterfall edge the reduces the risk of pressure points against the back of the thighs. The curved design also means that the seat actually serves reasonably well as a "leaning" seat, albeit not as well as some of the other options available. Because the seat curves "away" from the legs users are able to adopt somewhat of a "straddle" stance which enables them to achieve a fairly open angle between the thighs and the torso. Convenient Height Adjustment: Users can easily adjust the seat height without the need of remembering on which side the adjustment lever is positioned. A 360° ring inset just below the seat permits adjustment from any direction. Pulling the ring up will release the gas cylinder lock for easy height adjustment. Portable: The Twixt weighs in at under 15 pounds, making it easily portable. The ring release below the seat works well as a handle for moving between workstations. Storable: Since the Twixt can be lowered to 22" it can easily be stored out of the way when desired, even just tucked under the desk. Sturdy Construction: The Twixt is rated to support up to 250 lbs (114 kg). Shift your weight or position regularly to create a "rocking" motion by compressing the ring around the base. Don't expect the Twixt to provide freely rocking movement. The design of the Twixt is geared more to deliberate movements and does require a more active participation of the user to accomplish this. If a free and "instinctive" movement is desired you may wish to consider a Pivot or Mobis seat as an alternative. Avoid using the Twixt for extended "sitting" at too low an elevation (torso to thighs at roughly 90º to each other). This posture tilts the pelvis backwards and exerts high levels of stress on the lower lumbar region. This is compounded by the absence of a backrest which could possibly offset some of this stress by providing support to the lumbar region. Regularly shift your posture by adjusting the height at which the Twixt is positioned. Limited use at lower elevations should be mixed with regular adjustment to higher levels better suited to stool-like or leaning style use. Where possible also intersperse these postures with standing to achieve overall use of all postures.